Annual Special 2017 – Dev Diary #1 – How does it start? For the annual special, our game design team has a very long list of stuff they’d love to do at some point. The new tribes were there for a long time, but they never felt comfortable implementing them. But this year, they said: “yes, we can do it!” In addition, they received a lot of valuable feedback from the community and this helped them to have a more clear idea of the direction they wanted to go. So, the decision was made: there will be two new tribes. Why two? Because they thought many people would love to play a new tribe, so if they only created one new one, you wouldn’t have had a choice to make. Research is a huge part of the development process; sometimes it might take more time then actual development. You need to be sure that what you are about to do will not break the core game and that the time you will spend on development will be well spent. Jake, our game designer, told us that he never spent so much time before watching BBC and National Geographic documentaries devoted to this period! 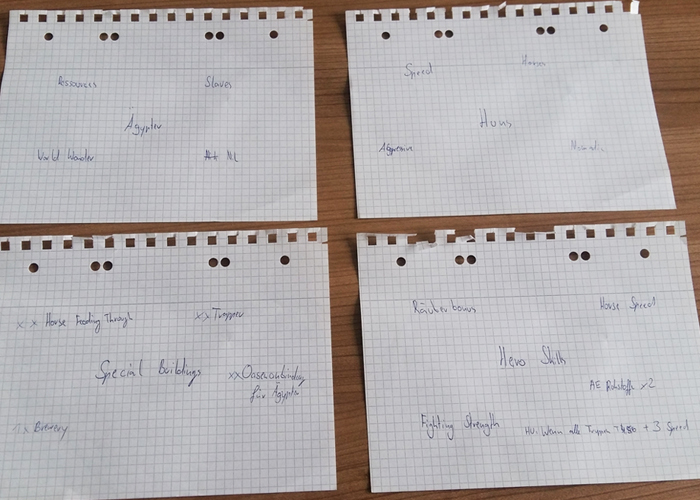 And here you get an insight of one of the very first brainstorming tools our game design crew used for the tribes. We stole this directly from an old notebook that belonged to Jake. What they did was write keywords on paper and start discussing the topic. And it could get really heated in the room at these times, so people preferred to stay away and let them focus. Next week, we will tell you a bit more about what’s coming next, when the “final” idea starts to take shape. Excited to try the new tribes out !!! !